Rumors have been swirling over the past few days as to the financial status of David Benyamine. Many in the poker community are speculating (though this is purely rumor and shouldn't be taken as fact at this point) that Benyamine has busted his own bankroll and is currently on the borrow from several players, most notably of which is Patrik Antonius. Some in the poker community are speculating that Benyamine currently owes over a million dollars to various players, with Antonius being owed the biggest chunk of money. Anyone who has followed the high stakes results on Full Tilt as of yet have seen that Benyamine has not been very successful as of late. I believe that he is down close to 2 and a half million dollars on Fill Tilt in the past month or so. The question is, how big is his bankroll? Can he absorb that type of a drawdown? And according to reports, he dropped a good sum of money in the PLO / No Limit Hold'em mixed game in Vegas over the past week. 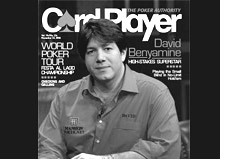 Again, just rumors, but the poker world is buzzing about this, so we will report it.